Upgrade your comfort to legendary GORE-TEX® weatherproofing at a price that'll leave gas in the tank. 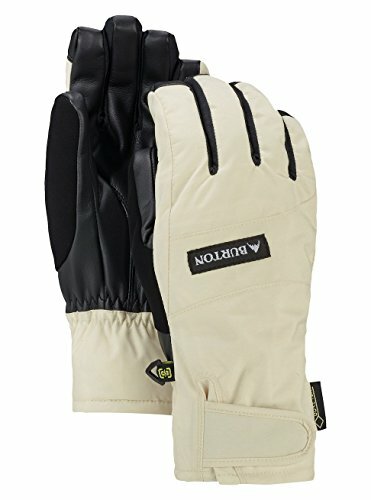 Like limo service on a hitchiker's budget, the women's Burton Reverb GORE-TEX® Glove keeps the GUARANTEED TO KEEP YOU DRY® promise by balancing waterproof and windproof protection with sweat venting breathability. Bang out texts or film your buddies with the touchscreen-compatibility of Screen Grab® built right into the fingertips, and warm up the coldest days with ThermacoreTM insulation. All this and you'll still have enough cash in the account to top off your gas tank. SCREEN GRAB® TOUGHGRIPTM PALM FOR TOTAL TOUCHSCREEN CONTROL This Burton-exclusive PU synthetic leather has the tech built right in, meaning it will never fray, wear out, or wash off. Any device, any finger-you get total touchscreen control without ever exposing your fingers to the cold. THERMACORETM INSULATION Developed for superior warmth-to-weight, ThermacoreTM cranks the heat without limiting mobility. We offer Thermacore in a variety of weights, and fine-tune the amount of insulation in the body, sleeves, and hood for focused warmth, enhanced breathability, and greater freedom of movement. DURABLY WATERPROOF, WINDPROOF, AND BREATHABLE GORE-TEX® MEMBRANE Gloves engineered with GORE-TEX® inserts are durably waterproof, windproof, and breathable - guaranteed. They offer enduring weather protection and comfort, balanced heat transfer, and optimum moisture management. As a result, your hands stay drier when you perspire and warmer when it's cold-no matter how nasty the weather gets. All of our GORE-TEX® membranes include the exclusive GORE-TEX® GUARANTEED TO KEEP YOU DRY® promise. BRUSHED MICROFIBER FIXED LINING The unique breathability properties of microfiber make it ideal for pulling heat-robbing moisture away from your body before it crashes your party.